Content controls are a category of controls that can hold a single nested element, which represents its content. Since the nested element can be anything, controls that derive from ContentControl can store a variety of different types of content. Content controls have a Content property, which points to the single element that they contain. The element is often an UIElement, but can be any .NET object. 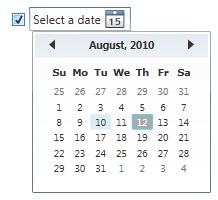 Here’s an example, with CheckBox using a DatePicker as its content. Note that because the Window class is a content control, a Window may have only one child element. You can effectively include a collection of controls in a content control by including as its content a single container object that in turn contains other elements. (E.g. A Button could contain a StackPanel, which would then contain other elements).